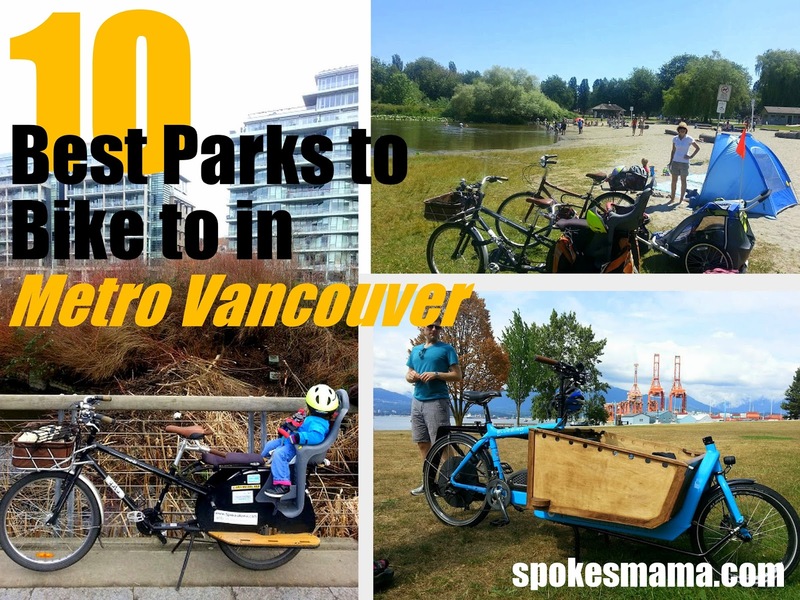 I know it's Februarainy, but I was inspired by some of the recent sunny warmish days we have had lately around here to put together a list of parks we love riding to. Plateau Park is a new playground on the very northeastern edge of Vancouver, between the roller coaster of the PNE & the former temporary home of the Vancouver Whitecaps, Empire Stadium. The park has a mini pump track that's great for kids wanting to try out dirtbiking on their runner bikes or 14" BMXs. There are some swings, an elaborate rope climbing structure, some exercise equipment for the adults & the fastest slide in any playground I've ever been on. There's a bike route that goes through Hastings Park to the playground & it's not too far off the Adanac Bikeway. Kitsilano Beach Playground is next to the concession at Kits beach, with a great view of the water. There's a sand play area with water, a merry go round net cone thingie, various types of swings & a play structure with slides for kids from toddlers up to much older. It's nice & open with good sight lines around the park & quite a few benches for parents to sit & watch the kids. Getting to Kits Beach by bike from the east is lovely by the seawall or taking 10th Avenue & then Cypress down the hill. Confederation Park is a good ride with quite a bit of elevation gain. There's a trail along the very north edge of Burnaby that goes through forest leading directly to the park--it's great on a hot summer day to be in the shade under the tall trees. Confederation Park has a water park, a great playground & is next door to the Model Railway that you can ride around on for just a couple bucks per person. VanDusen Gardens isn't technically a park & doesn't have a playground, but it's a lovely place to bike to. The kids like the hedge maze & running around in the meadow there. It's a fantastic place for a picnic on a spring day too. There are tons of bike racks there & it's right on the 37th Avenue bike route, not far from Heather street & Ontario as well. Ceperley Meadow is the park right next to Second Beach Pool & Concession in Stanley Park. It's home to the vintage fire truck that you probably climbed on as a kid with lots of variety in its two playgrounds. It's a beautiful ride along the seawall to get there, only about a half hour from our house. 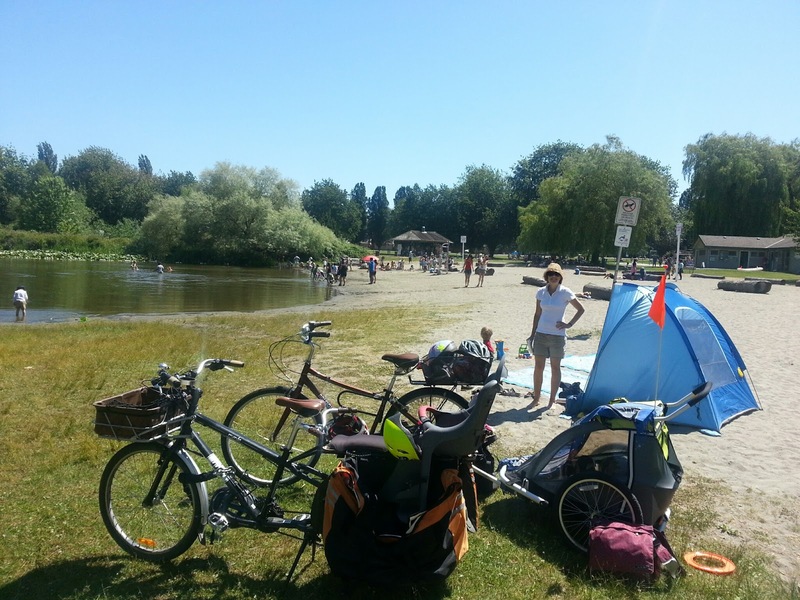 Spanish Banks Park doesn't have a playground, but offers some great natural features for kids to play in. We try to go ahead of low tide so we can walk out on the sandbars & wade through the shallow tide pools. It's a lovely flat ride along the seawall & through the new Point Grey Bike route, so even the smallest riders can bike on the all ages & abilities separated route. Hinge Park is pretty close to the edge of what I think of as our neighbourhood, so doesn't really qualify as 'farther afield', but it's worth mentioning. It's at the foot of the Ontario Bikeway & along the seawall on South False Creek next to the Olympic Village. Hinge Park has a cool water feature that sends water down multiple layered chutes into a shallow gravel puddle at the bottom of a hill. There's a pond there with a resident beaver & little pathways including one that leads through a big metal tube with viewing ports in the sides & bottom that looks a bit like a submarine. The north end of Hinge Park is Habitat Island, a little peninsula with a rocky path beach that's great for throwing stones into False Creek. If you haven't biked to these parks before, check Google maps to plan your route. You can get biking specific directions & turn on a layer of the map to show the bike routes in the city. Translink has PDF bike maps for Vancouver & surrounding cities here. Or if you prefer the old school on paper kind of map, the new Vancouver cycling map is out. Pick yours up at City Hall's information desk, libraries, community centres, biking events, & some bike shops around town. 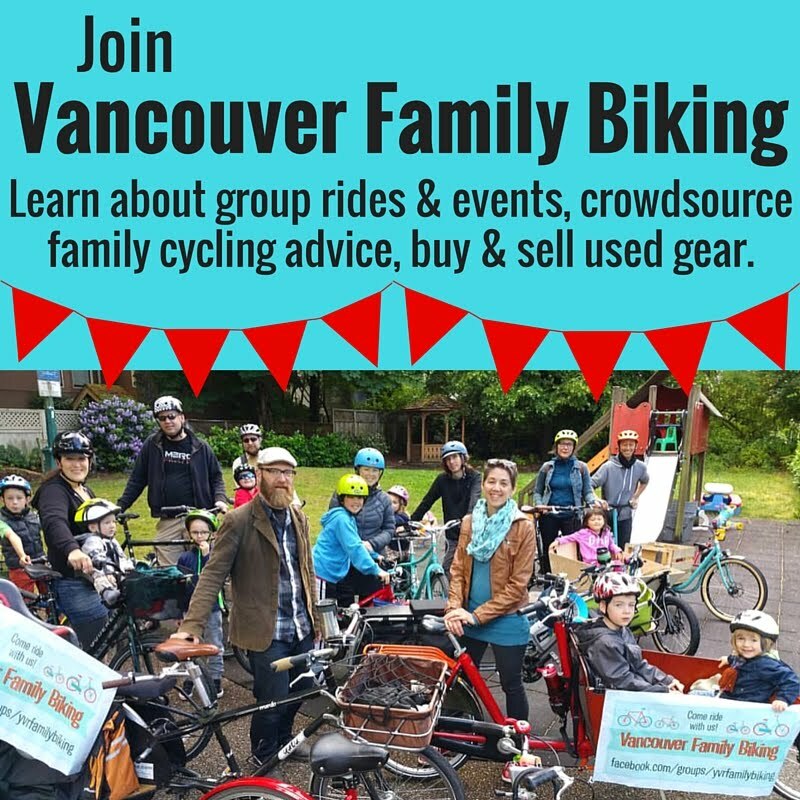 If you want some tips from other families about the best routes to take, join Vancouver Family Biking & ask there for advice or invite other families to join you! Have you ever been to any of these parks? 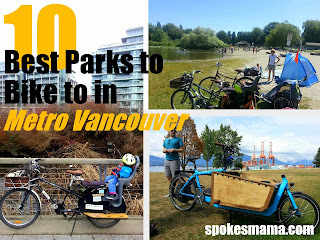 What's your favourite park to bike to?